In the mid-19th century, a time when class distinctions remained rigid, Il Trovatore served as a tragic warning of the dangers in judging people according to their socio-economic station. The Count di Luna (Robert Hyman) is strongly attracted to Leonora (Michele Capalbo), a noblewoman, but she is in love with Manrico (Avgust Amonov), the troubadour (Il Trovatore), a commoner. We get the background on the story from Ferrando (Wayne Tigges), the Count's chief officer, who explains that Count plans on eliminating his rival through a military attack. Tigges' stirring bass sets an ominous mood from the top, recounting a strange tale involving a gypsy's curse and the disappearance and apparent death of the Count's younger brother. 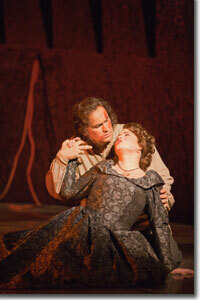 Capalbo wows us with her impressive range, bel canto adornments, Italian trills, and theatrical polish. 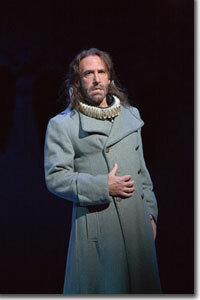 Hyman's rich baritone manifests the count's empowerment. His rival, Manrico, is the tenor, and Amonov's voice work is emotive and thrilling, though his acting is detached and disconnected from Capalbo, rarely looking her in the eye (until she's dying), so the chemistry falls short. The three-part harmony between Capalbo, Hyman, and Amonov at the end of the first act is gorgeous. The Opera Colorado chorus is remarkable throughout and does the famous "anvil chorus" proud at the beginning of Act II. Nancy Maultsby, as Azucena, the gypsy woman, regals us with her warm mezzo. Alexander Polianichko leads the Opera Colorado Orchestra through a sumptuous rendition of Verdi's lovely melodies and rousing atmospherics. 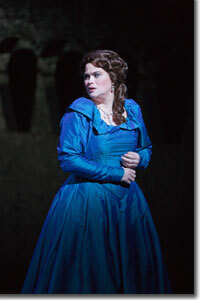 The scenery and properties from the Minnesota Opera Shops and the costumes by the Seattle Opera Costume Shop are first-rate. Opera Colorado's Il Travatore concludes with performances Friday, May 4th at 7:30 PM and Sunday, May 6th at 2:00 PM. 303-357-ARTS.